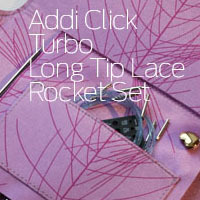 Addi Click Rocket Interchangeable Needles with shorter tips - making knitting with shorter cables possible for sleeves, hats and smaller circumference projects. This set comes with the 16 & 20" Cords. This set comes with the new LIFELINE cords, which allow you to knit with your lifeline thread attached! Cool. 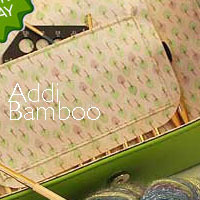 The Addi Click system gives you flexibility, versatility, and portability. 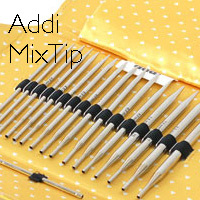 Choose from multiple sets with 8 to 10 different tip types, multiple cord lengths, plus accessories that all fit and work together. 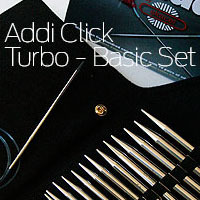 Pick your set and add to it—there is no end to the possibilities when you choose ADDI Click! 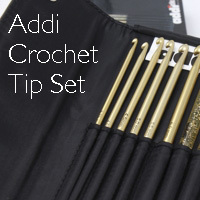 Made in Germany with a lifetime guarantee, the Addi Click interchangeable circular needle system includes Addi Turbo, Addi Turbo Lace, Addi Natura (Bamboo and Olivewood), and Addi Hook (Crochet) tips! The unique Click tips require no tools to change—just a quick twist and release. 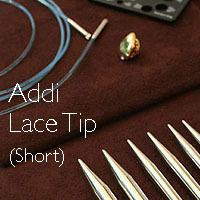 Addi Tips, cords and accessories like Heartsoppers and connectors extend the possibilities of your CLICK set! 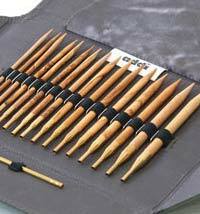 Addi Knitting needles have definitely become the gold standard in metal knitting needles. 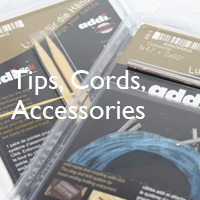 Choose from Addi Turbo Circulars in regular and lace tips, or Addi Click Turbo Interchangeables also in regular and lace, featuring bamboo as well as metal tips. We often switch back and forth during projects—using the lace tips for detail work, and the regular tips for ribbing, stockinette and garter. The work really does fly when you use these needles. 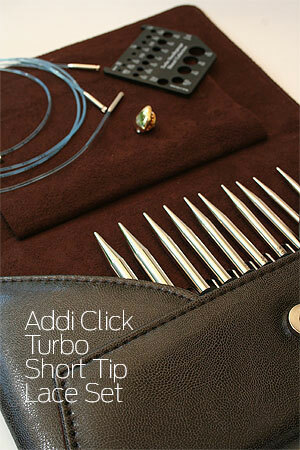 More about Addi Turbo and Addi Clicks below center.